As I have mentioned before, we are holding a Charity Quiltathon here in January and our volunteer quilters are going to be making quilts etc to help five different charities - Yorkshire Cancer Research, Yorkshire Air Ambulance, The Dogs Trust, Bridlington RNLI and Project Linus. 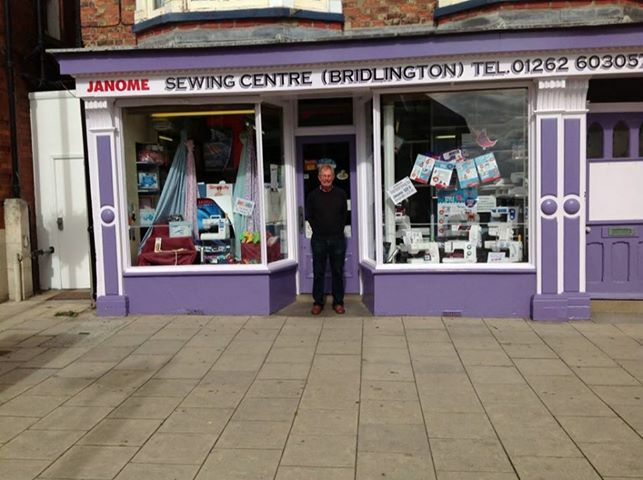 John (and Barbara) Hall from Bridlington, Sewing Centre. Thank you both so much, it very kind of you to support our event so generously. John is a whizz with machines, so if you need your machine serviced you can book it in for a service whilst you are here, or even buy a new Janome! They also have a selection of material, jelly rolls & most other bits and bats sewers require and all at a reasonable price and with great friendly and efficient service too.